The Professional Managers Association is incorporated under the Company Act and is Limited by Guarantee Company to benefit present & prospective professional managers. The Association’s main objective is to support the community of professional managers in UK by providing an environment for the exchange of knowledge, ideas, skill and experience, with the aim of furthering the level of professional expertise of professional managers. 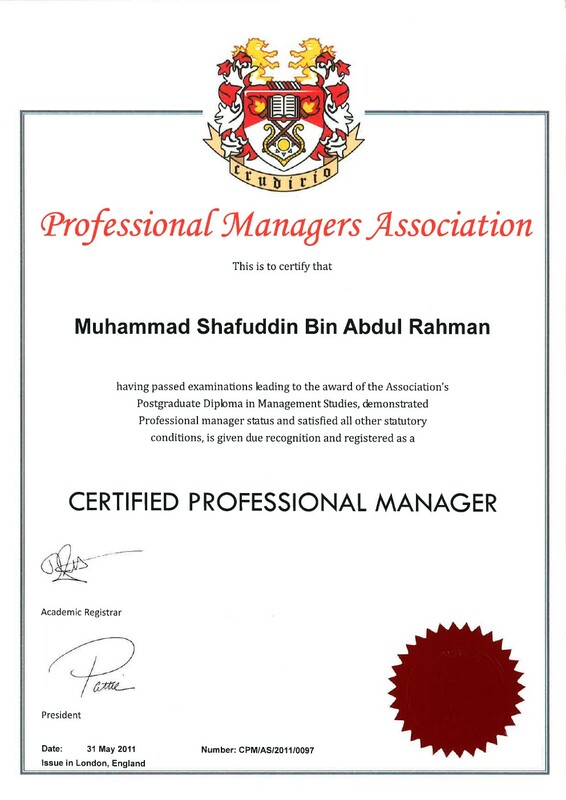 A Certified Professional Manager (CPM) is the most senior category of PMA membership. The qualification and experience associated with this category of membership in Clause of PMA constitution means equivalent Master degree. Candidates with overseas qualifications shall have to qualify PMA professional competency examinations to be eligible to apply for this membership, however the PMA membership committee can take their overseas professional experience into consideration. Membership of the Association is open to professional managers of all disciplines who are interested in furthering the objects of the Association. Every application for membership to the Association shall be in writing on prescribed membership forms and signed by the applicant. The application for membership shall be submitted in such form as the Board allows from time to time and prescribes. According to PMA’s understanding, a Professional Manager does not simply mean a manager of a business or industry rather it’s a generic title used for all those involved in the managerial or administrative role of any public or private office, educational institution, entrepreneurship, financial, production, manufacturing, engineering, logistics, transportation, advertising and any other business or business. It also includes the professional managers of charitable, religious and non-profit making or social welfare agencies. To become a Certified Professional Manager, you should have a Postgraduate Diploma or Master Degree with 10 years managerial experience or a qualifying examination. To become a Certified Professor, candidates must have published at least three research papers of sufficiently high standard in the Journals recognised by the membership committee of good international standing. You will obtain a discount if you are our partners, students, faculty staff or graduates. Awards will be delivered in 5-7 weeks upon completion of application form and confirmation of payment.